An exceptional Grade II Listed detached farmhouse believed to have origins dating back to the early 17th Century and enjoying an enviable idyllic setting with far reaching countryside views. 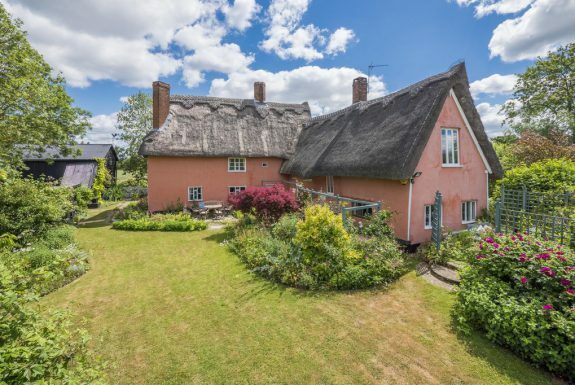 This impressive period farmhouse has been meticulously cared for over the years and is presented to the highest of standards throughout whilst retaining many notable character features; of particular note is the clever display of wattle and daub into the hallway and large inglenook fireplace to the dining room. The remainder of the property combines everyday modifications particularly well and includes underfloor heating to the ground floor and a recently installed en suite bathroom to the master bedroom. 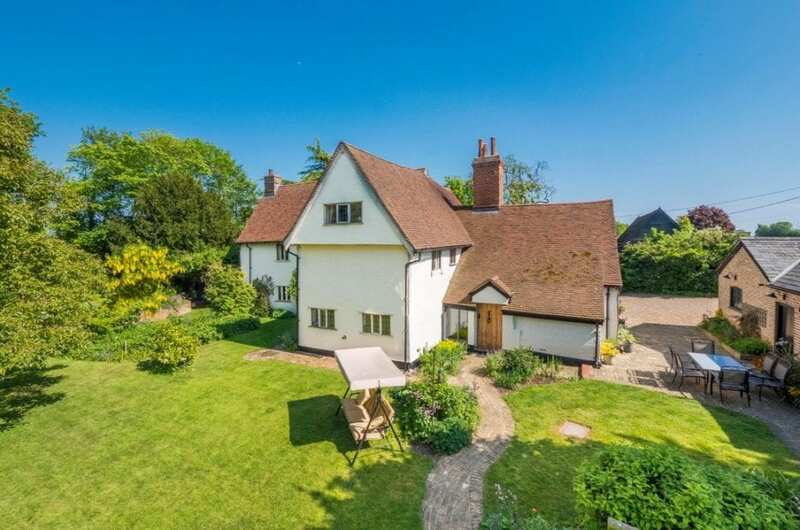 This delightful property sits centrally within its plot and incorporates formal gardens with adjoining moat, kitchen garden and is further enhanced by off street parking for multiple vehicles with adjacent detached double garage and connecting workshop. The grounds are believed to measure approximately one acre. DRAWING ROOM: 20'8 x 15'7 (6.31m x 4.76m). A wonderful dual aspect room with two mullion style windows overlooking the front and rear grounds. Attractive brick flooring. Red brick fireplace with Oak bressumer and inset wood burning stove set upon a brick hearth creating the main focal point of the room. DINING ROOM: 17'8 x 14'5 (5.39m x 4.40m). A truly impressive room with an exceptionally high ceiling measuring approximately 4.5m with two high feature mullion windows and a galleried landing. Attractive brick flooring. Large inglenook fireplace with red brick surround under Oak bressumer and having inset wood burning stove set upon a brick hearth. Extensive display of exposed timbers and studwork. KITCHEN/BREAKFAST ROOM: 19'8 x 14'6 (6m x 4.42m). A superb room with country style wall and base units under a tasteful combination of granite and wood work surfaces which incorporate double sink unit with separate water filter mixer tap and single drainer. Further integrated appliances include inset double oven with four ring electric hob, dishwasher and freezer. Central matching preparation island with granite work surfaces. 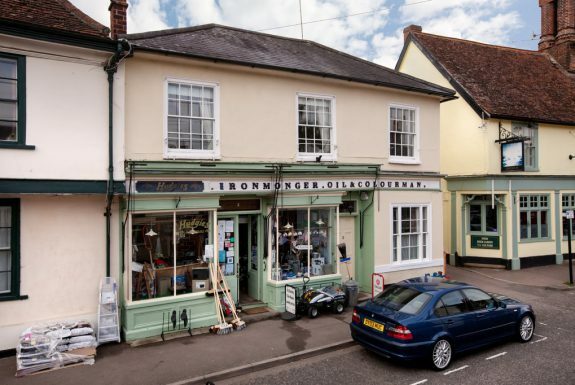 Space for AGA (available by separate negotiation) set in former fireplace under Oak bressumer. Attractive brick flooring. Opening to staircase rising to first floor. Suffolk latch door opening to PANTRY - a large useful walk-in storage area with water softener. REAR HALLWAY: With attractive brick flooring. Exposed wattle daub. External rear door to grounds. UTILITY: Fitted with three large storage cupboards and base units under wooden work preparation surfaces that incorporate sink unit with mixer tap and having space and plumbing for washing machine and tumble dryer. Exposed ceiling timbers. Brick flooring. Window to rear aspect. Oil fired central heating boiler and airing cupboard. STUDY: Currently used as a home office. Attractive brick flooring. Rear aspect. Cupboard housing hot water cylinder. CLOAKROOM: Fitted with corner storage cupboard, W.C, and Oak pedestal wash hand basin. GALLERIED LANDING: A truly splendid galleried area overlooking the dining room with feature high mullion windows and exposed red brick chimney stack. Exposed timbers and studwork. Built-in storage cupboard. Bespoke Oak staircase rising to the second floor. EN SUITE: Fitted with corner shower cubicle with tiled surround, W.C. and wash hand basin with vanity cupboard beneath. BEDROOM 2: 17'9 x 14'4 (5.40m x 4.37m). A charming dual aspect room with views to the front and side. Door to second staircase providing access down to the kitchen. BEDROOM 3: 11'1 x 9'11 (3.39m x 3.03m). With views to front aspect with feature mullion style window. Built-in cupboard. BEDROOM 4: 12' x 9'1 (3.65m x 2.77m). With views overlooking the side garden. Mullion style window. Exposed timbers and studwork. BATHROOM: 16'2 x 5'11 (4.92m x 1.80m). Having Oak floorboards and exposed timbers. Suite comprising freestanding oval bath with mixer tap and shower attachment, corner shower cubicle with tiled surround, high level W.C. and pedestal wash basin. LANDING: Accessed via a bespoke Oak staircase. BEDROOM 5: 14'8 x 9'9 (4.47m x 2.96m). With vaulted ceiling and exposed wall timbers. Mullion style windows to front. Door providing access to walk-in attic space - ideal for storage. BEDROOM 6: 12'8 x 9' (3.85m x 2.75m). Having exposed wall timbers. Leaded light window overlooking the rear grounds. 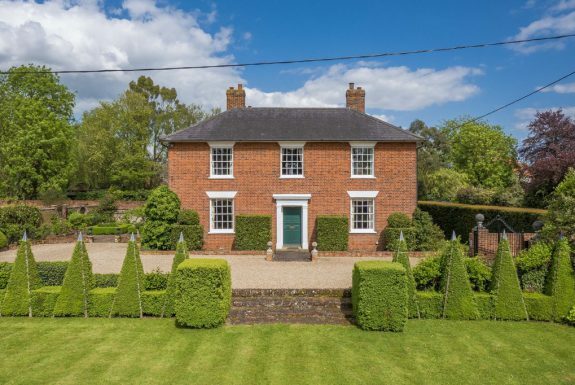 Outside This exceptional property is away from the road and is approached via a five bar timber gate leading to a gravelled driveway which in turn provides off road parking for multiple vehicles and access to the remainder of the grounds, house and outbuildings. 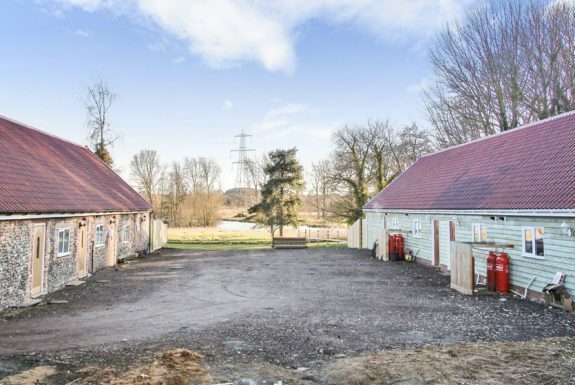 The outbuildings currently consist of a DOUBLE GARAGE 21'5 x 15' (6.54m x 4.57m) with two sets of timbers doors, power and light connected. Door providing access to the adjoining WORKSHOP 12'8 x 12'6 (3.85m x 3.81m) with power and light connected, range of shelving and workbenches. Personal side door to grounds. Adjoining STORE. The remainder of the front garden is predominantly lawn and having well established trees and mature hedging creating natural borders. The rear grounds are a sheer delight and are partly moated creating an idyllic setting and encouraging wildlife to the grounds. The rear grounds are cleverly designed into two distinctive areas - the formal garden being predominantly lawn and having well stocked flowering beds with established trees. Detached garden store with slate roof and adjoining log store. Attractive brick path with pergola which in turn leads to the kitchen garden with adjoining orchard. The kitchen garden has raised beds interspersed with gravel pathways and lawned area. Cobbled terrace area with former borehole.